These straight-pitch diamond taper files are mainly used for filing inside slots or grooves, where are inaccessible with straight files. All specifications can be custom made. Kit assortments are flexible upon requests. 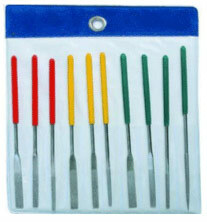 For more information of diamond needle files please contact us.